Terrence Chan: I won a tournament no one showed up for! I won a tournament no one showed up for! I wish this were a story about winning my first big buy-in poker tournament since the 2009 WCOOP. And, for those who missed it, I did in fact win the "$4600+400" (the scare quotes a result of an irksome hidden juice) buy-in Canadian Open Poker Championships Heads-up Event, which had just 12 players and a first prize of C$34,000 (US$34,437). I did not receive a first round bye and thus beat four opponents, so from a certain standpoint I do feel like I actually accomplished something. Playing heads-up is always a grind because of the sheer number of decisions, and something about live heads-up NL is particularly fun and challenging because there is so much information to constantly process. I had a lot of fun playing the tournament (which had an excellent best-of-3 structure) and was very happy with the win. @muckingaces tweeted: "Wtg, Terrence. But next time ask them to colour down the chips for the victory photo." But sadly, this is not in fact a post about me winning a 5k buy-in poker tournament. It's mostly a post about how disappointing this particular tournament series turned out to be. I was quite excited to come to Calgary for this tournament, as I did in 2009 and 2010. In 2009 I finished 3rd/4th in a 63-player field. In 2010, I lost in the 2nd round in a 64-player field. In 2011, they dropped the buy-in to $2000 but still saw their field halved to 32 players. This year, in an attempt to increase the field size (and in an apparent attempt to defy economic theory) they brought the buy-in back to $5000 using the logic that it would draw more out-of-town players, thereby increasing the field. Well, it didn't work. Unless you are running a 6-figure buy-in tournament and hope to attract a lot of hype, a 12-player field is horrendous. The ambiance of the my semifinal match stood out in particular. After the other semifinal match finished, the only people in the sizeable tournament poker room (which is usually a room for shows and musical acts) were me, my opponent, the dealer, the relief dealer, and the tournament director. Due to some sort of technical issue, there wasn't even background music. Hell, there wasn't even the slot machine white noise, or the usual ubiquitous chip-riffling sounds (since we held the only chips in the room in our hands). It was pin-drop quiet, and incredibly eerie. The setting was made even more surreal by the fact that we were playing in this empty room on an elevated stage, for the benefit of an audience of absolutely no one. As weird as that was, the 6-max the next day was the true disappointment. This was a $2000 buy-in re-entry tournament which got 17 entries, a simply appalling turnout. I can kind of understand when the locals aren't interested in playing a $5000 heads-up tournament because many casual players are often intimidated by heads-up, but to get this kind of a field for a $2000 6-max NL is beyond fathomable. There's a lot of speculation as to why this tournament turned out to be such a failure, from staff to marketing, a lack of satellites, and of course conflicts with Legends of Poker in LA, WPT Barcelona, and another more well-established tournament series in Edmonton. I'll leave the public speculation to those better informed, but the numbers are obviously disappointing for a tournament that had a very fun looking schedule on paper and that has done well in the past. What I know wasn't at fault was a poor poker economy, because many big cash games (10-25 up to 25-50-100) were going with regularity. Calgary boasts one of the strongest economies in the country, poker is still big in Canada, and clearly there was already lots of money in the building. But none of it was going into the tournaments. 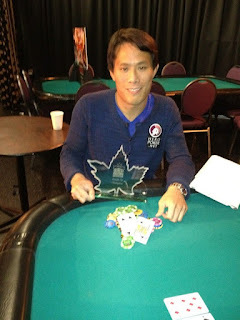 It's certainly a strange feeling to walk away with a tournament win and $24,800 profit over three days and still feel a bit blasé about the experience, but in previous years I enjoyed this tournament because many fellow Canadian pros and other individuals from the poker industry would turn up for it, and it was fun times. And the Deerfoot Hotel, while a nice enough facility, is in the total middle of nowhere 20 minutes outside of downtown Calgary, and I didn't have a car. Even if I did, I didn't really have anyone to hang out with anyway. I resolved long ago not to travel to poker tournaments where there wasn't some compelling reason to go other than the poker. In the end, this experience solidified the idea that my heart is no longer into playing poker for a living. Money and the stuff it buys is great, but at this point I'm really looking to place more importance on having fun and improve my quality of life rather than just making the bank account bigger. So in the end, I burned a few more Air Canada miles and $100 in change fees to come back home Thursday morning instead of Saturday night, bypassing the $1000 PLO event and the $2000 main, both of which I had originally intended to play. I'll be curious to see the numbers for both, but it seems likely they'll be as underwhelming as everything else this week. In any case, I'm looking forward to home, seeing friendly faces, getting on the mats and in the ring, and catching what remains of the Vancouver summer. And if I really do feel an overwhelming urge to try to win some more money at poker, I hear there's a little series on the Internet starting up this weekend.